If, like me, you’re a peanut butter and chocolate lover then this chocolate peanut butter ice cream sundae is for you too. There’s something very appealing about salt and sweet. You get so many levels of flavour as you spoon into the glass and then into your mouth. The vanilla ice cream sets it all off very nicely. To start things off, I made some peanut butter blondies with salted dark chocolate chips. As I’m sure you can imagine, they were super scrummy all on their own. I’ll be blogging the recipe at some point in the future. These blondies formed the base of my chocolate peanut butter ice cream sundae. I piled some vanilla ice cream on top. It wasn’t homemade this time, but it was organic. Over this already lush combination, I poured some dark chocolate sauce and then drizzled sweet peanut butter sauce over that. A valentine’s sundae fun day. Of course you don’t need to keep such a scrumptious offering as this chocolate peanut butter ice cream sundae just for Valentine’s Day. It would be perfect for any special occasion and can be enjoyed all year round. It should come with a serious sugar and fat overload health warning, but sometimes it’s good not to think about it. My philosophy is, as long as it’s occasional, it’s good to indulge from time to time. The recipe can easily be doubled, tripled or quadrupled if you want to share it with family and friends. You can see we polished off this delightful dessert with relish. In fact, we might just have had one or two more – not on the same day though. Honest! So here’s to another nine years of blogging and I hope you enjoy this delicious chocolate peanut butter ice cream sundae as much as we did. If you’re keen to make this sundae straight away and don’t want to wait for my peanut butter blondie recipe, here are a few other recipes you could use as the base. A decadent but desirable dessert for two, which is also quick and easy (assuming you've already made the blondies / brownies. Of course you could double, triple or quadruple the recipe to enjoy with family and friends. Cube the blondies and place in a sundae dish or glass. Pile in 2 scoops of ice cream. Pour some hot chocolate sauce over the top and watch it freeze. Drizzle over a little of the peanut butter sauce. Add a couple of sugar curls, if you like, and tuck in. Place the water and sugar into a small pan and bring to a simmer to melt the sugar. Turn the heat off and add the chocolate. Stir until melted. Stir in the cream and gently reheat if necessary. Whilst the chocolate is melting, place all ingredients into a small pan and slowly bring to the boil, whisking as you go. It will look terribly gloopy to begin with, but will come together if you keep stirring. Add a little more water if the mixture is too thick. If you can't get hold of salted chocolate, just add a small pinch of sea or rock salt to the water and sugar. 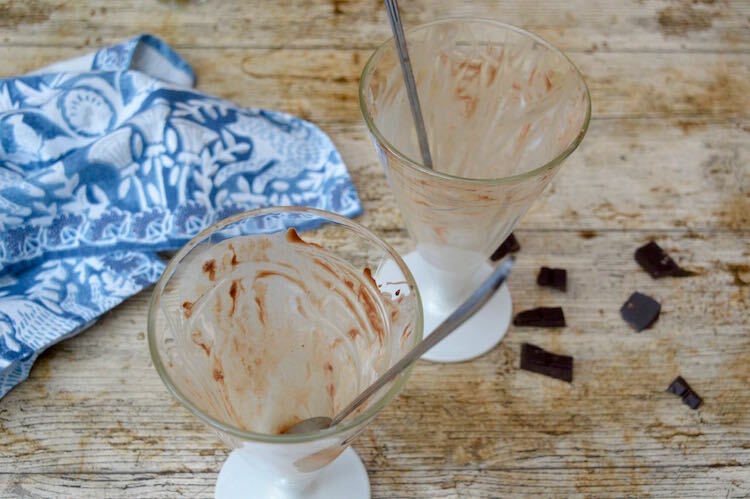 This chocolate peanut butter ice cream sundae is my entry to this month’s #WeShouldCocoa. If you’ve blogged any recipes this month where chocolate features as a main ingredient, please do join in. I’m also linking these valentine’s treats up to #CookBlogShare over at Hijacked by Twins. Thanks for visiting Tin and Thyme. If you make this decadent ice cream sundae I’d love to hear about it in the comments below or via social media. Do share photos on your preferred social media site and use the hashtag #tinandthyme, so I can spot them. For more delicious and nutritious recipes, follow me on Twitter, Facebook, Instagram or Pinterest. Chocolate Peanut Butter Ice Cream Sundae. PIN IT. I’d love one of these, especially with your home made blondies and that peanut sauce!!! I can highly recommend it Kavey and the blondies are sublime all on their own. Thanks Elizabeth. Salted chocolate is a firm favourite here. That looks totally awesome! Even on a cold snowy day like today, I could devour one of your lovely sundaes. It’s an all year round sundae Janice – just think hot chocolate sauce. Thanks Eb. I hope I can keep going another nine years. Chocolate and peanut butter…two awesome ingredients that we love dearly too. A perfect dessert! Happy Blogiversary of 9 years!!! Aw, thank you. You wouldn’t believe how little I’ve covered in nine years. Or rather, how much more there is yet to blog about. Yum! These look like my ideal sundae. Thanks Jo. It’s just as well anniversaries don’t come around too often, but it’s a great excuse to indulge when they do. Congratulations on 9 years – that is a great achievement – and a lot of chocolate delights. Love the sundae – I am not so into them by my 8 year old is so I will need to return here for inspiration next time she is hankering for one. Thanks Johanna. I just find it astonishing that 9 years has passed so fast. And you have an 8 year old already – how did that happen? Thanks Claudia. Peanut butter and chocolate is a popular combination. I love homemade blondies and putting them in this sundae is a brilliant way to celebrate both Valentine’s Day and 9 years of blogging! Thanks Corina. Blondies always seem like such an indulgence, but oh my, they are good. Ooo that sundae would surely win my heart! Chocolate, peanut butter and ice cream. Yes, yes and yes. What an amazing combination. I’m so glad OH doesn’t like peanut butter – more for me. Hahaha, that’s a good way of looking at it Sisley. It was great to have such a good excuse to indulge. Oh my! This looks and sounds delicious. Guess what I am making this weekend! I hope you like it. Do let me know how you got on. Well you made me chuckle Kate 🙂 I have to warn you, these are very downable.